Janet Evanovich and Lee Goldberg, bestselling authors of The Heist,return in this action-packed, exciting adventure featuring master con artist Nicolas Fox and die-hard FBI agent Kate O’Hare. And this time around, things go from hot to nuclear when government secrets are on the line. Internationally renowned thief and con artist Nicolas Fox is famous for running elaborate and daring scams. His greatest con of all: convincing the FBI to team him up with the only person who has ever caught him, and the only woman to ever capture his attention, Special Agent Kate O’Hare. Together they’ll go undercover to swindle and catch the world’s most wanted—and untouchable—criminals. Their newest target is Carter Grove, a former White House chief of staff and the ruthless leader of a private security agency. Grove has stolen a rare Chinese artifact from the Smithsonian, a crime that will torpedo U.S. relations with China if it ever becomes public. Nick and Kate must work under the radar—and against the clock—to devise a plan to steal the piece back. Confronting Grove’s elite assassins, Nick and Kate rely on the skills of their ragtag crew, including a flamboyant actor, a Geek Squad techie, and a band of AARP-card-carrying mercenaries led by none other than Kate’s dad. A daring heist and a deadly chase lead Nick and Kate from Washington, D.C., to Shanghai, from the highlands of Scotland to the underbelly of Montreal. But it’ll take more than death threats, trained henchmen, sleepless nights, and the fate of a dynasty’s priceless heirloom to outsmart Fox and O’Hare. 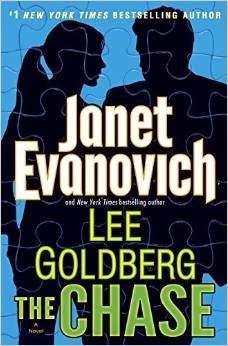 The Chase is a great addition to the brilliantly crafted Fox and O'Hare series by Janet Evanovich and Lee Goldberg. This book takes readers along with Nick and Kate after former White House chief of staff, Carter Grove who's stolen more than meets the eye. The Chase dives further into Kate's relationship with Nick and gives us glimpse into Nick's past. The story and con in this book were good, not as great as in The Heist but they were still enjoyable to read. The book was full of great moments and some really funny scenes. My favorite thing about this book was getting to learn more about Nick's past as well as see his relationship with Kate move forward, if only a little. The two are not only a great team, but generally great together. As for Nick's past, lets just say it's as colorful as he is. We got to see some repeat characters return and meet new one's including Duff MacTaggert a key person in getting Nick into the con game. The one problem I had with this book was the pacing. I found it to be rocky and slow in the middle. The start the book was good and then fell a little flat as Nick and Kate worked to steal back a rare Chinese artifact from a plane. The pace finally picked back up later when the duo moved on to hitting the man who stole the artifact in the first place and we were finally treated to a real con. There was a lot of character building in The Chase, which I enjoyed. I feel like this book did a lot for the characters, especially Nick and Kate. It built up a lot of what was started in the first book and gave readers a good look into how this team is going to work in the future. I am eager to see where their relationship goes from here and how their work together changes and molds over this series. Overall The chase was a wonderful read. I wish that the pacing had been a little better but I know that in the next book that should be rectified. This was a good sequel to a great series and I am eagerly awaiting the third book in this series The Job.